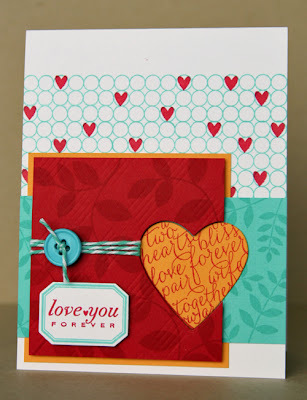 Lots of sets used here: Background Basics: Circles for the rows on the upper part of the card base; Love Lives Here for the little heart that I "randomly" stamped in some of the circles (trying to deliberately make something look random can be harder than it sounds, lol! ); Turning a New Leaf for the tone-on-tone pattern on the Pure Poppy and Hawaiian Shores panels; and Little Labels for the sentiment. Originally, I was going to stamp the heart directly on the blue panel. But I wanted more contrast and I wanted to bring in the Summer Sunrise to tie into the mat behind the red/blue elements, so I stamped it onto the die-cut heart instead. I also impressed the red with the Picnic Plaid impression plate, and the blue with the Canvas IP. The red is popped up on foam adhesive, and the "love you" label is also popped up. The twine and button finish it off! It's still snowing here... who knows, maybe I'll get back to the stamp table this evening. :) Thanks for looking! Wonderful colors! Love, love, and love and some more love for them! This is really stunning. You have so many good ideas on this card, but they all work together so perfectly. I think the most striking thing for me is that die cut heart with the red stamping, tucked into that other layer. Just brilliant. And, I'm jealous of your snow. Loving the fun colors on your card. Stunning card and great use of color. There are so many great details. Wow..love it! Absolutely wonderful! So full of color and texture, I love this! Another one knocked out of the park, Debbie! I love the colors, the mix of backgrounds (and yes, it is HARD to make something look random!). I love this!! !